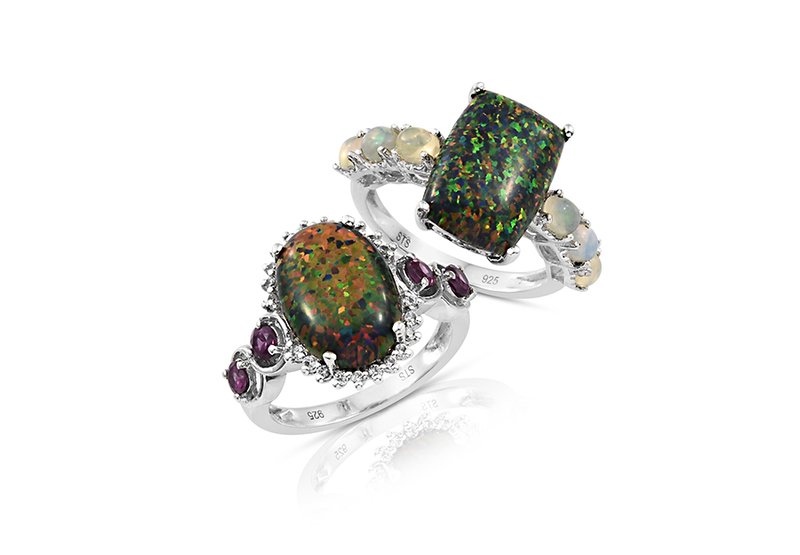 Discover pinpoints of kaleidoscope color with Lab Created Black Ridge Opal. Opal is the world’s most popular gem. Ancient cultures across the world held opal in high-esteem for centuries, attributing a variety of supernatural qualities to this gem. Even today, opal gemstones continue to capture our imaginations. Demand runs high, limiting the supply of natural opals for gem-hungry consumers. Lab Created Black Ridge Opal is ready to meet this demand. This synthetic gem is everything you love about natural opals, and then some! For precious opals, two factors combine when describing their color. The first is bodycolor. Bodycolor is the backdrop for a phenomenon seen in precious opals known as play-of-color. Play-of-color represents a unique pattern of colors seen in precious opals. Lab Created Black Ridge Opal possesses a deep and murky black body color. This inky blackness seems to swallow surrounding light, drawing it toward the gem. Compared to natural Australian black opals, this is the ideal color in black opals. Why? For the play-of-color, of course. When describing precious opals, the play-of-color is the most critical factor in determining value. The best natural opals will have unbroken play-of-color throughout the stone. Ideally, it will also occur in an exciting range of colors. However, Mother Nature can be fickle at times, and these natural stones may not always desirably display both qualities. Fortunately, Lab Created Black Ridge Opal displays a very full and intense play-of-color! Running the spectrum, patches of color appear throughout the stone as you turn it over your hands. Reds, oranges, blues, and greens are all on majestic display. 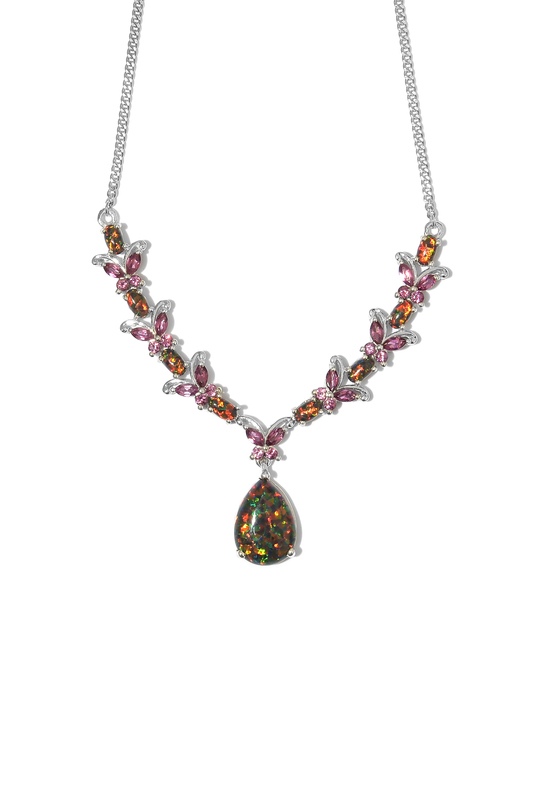 Due to the proprietary creation process, they appear as points of color within the gem. 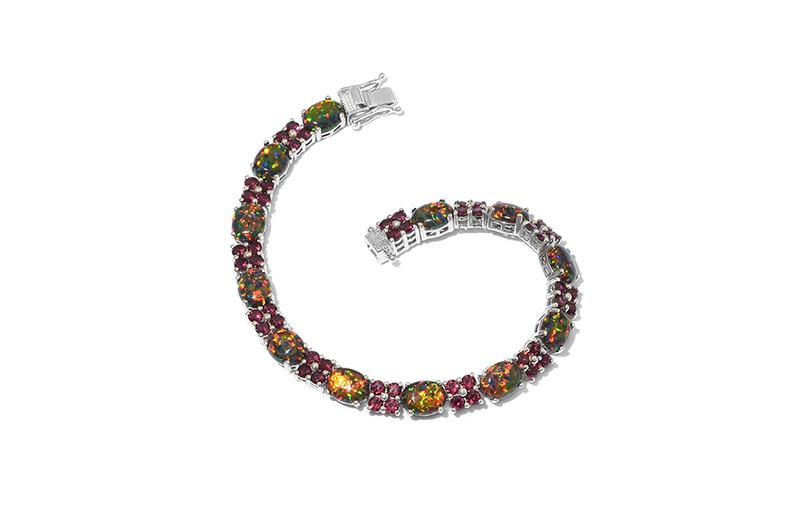 Sometimes, this arrangement of colors is known as pinpoint or pinfire within the gemstone trade. Opals have always been considered to be a delicate gemstone. The unique structure of the gem means that when compared to other stones, we must still exercise extra caution with our opals. Even synthetic opals are subject to this truth. Well, most anyway. Synthetic opals are often subject to chipping, cracking, or crazing. 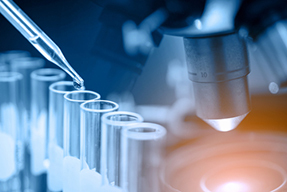 Lab Created Black Opals, however, are engineered with an extra element of protection. A small amount of resin polymer is impregnated into the stone, helping stabilize the jewel. 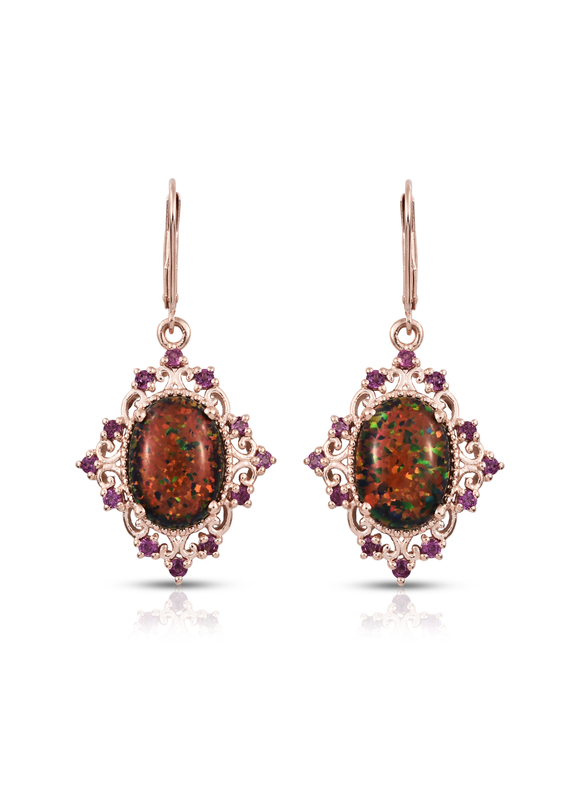 This means these stones can be worn much more freely than naturally occurring opals or other synthetic opal gemstones. Usually, synthetic opals are molded to preset conditions. This means there is little room for innovating creative designs due to this built-in limitation. Their brittle nature also reduces the possibilities. Lab Created Black Ridge Opals, however, can be shaped the same way as natural opals, thanks to their unique creation process. This means you’ll find them in all the shapes and sizes you’d expect from Shop LC. Find them in sizes from a half-carat to over ten carats! It’s truly a great time to be an opal connoisseur. Is Lab Created Black Ridge Opal a Birthstone? • Opal is one of two modern October birthstones. While there are ample choices among opal gemstones, Lab Created Black Ridge Opal is an excellent alternative to many of the natural opal options. It’s a great opportunity to own an opal gemstone with an incredible play-of-color that rival natural material from Australia. • Opal is also the traditional gift for the 14th wedding anniversary. Naturally occurring opals are found all over the world. Australia is the most significant producer of opals, known for several varieties. Among these, black opals from Lightning Ridge are perhaps the most famous stones to ever come out of this country. Emulating these famous stones is the goal of Lab Created Black Ridge Opals. You be the judge if they succeed. How are Lab Created Black Ridge Opals Made? Synthetic opals have been available since the mid-1970s. For many years, they were set apart from natural material due to their very ordered structure and highly porous nature. Telltale signs exist that let you know you’re dealing with synthetic opal. In the late 2000s, a Japanese firm pioneered a new technology resulting in a superior synthetic opal. What makes them superior? The proprietary process addresses many of the criticisms consumers share about synthetic opals. Closely guarded techniques ensure that these opals are grown with a structure that emulates natural opal. This means color patterns are less predictable, providing the same surprising variety found in nature. Also, the coloring process means that an even bodycolor is dispersed throughout the stone, ensuring that it looks its best no matter how it’s viewed. Finally, by introducing a small amount of polymer resin, these lab created opals are more stable than other synthetics. Not only can they be shaped the same way as natural opals, but they also aren’t susceptible to same drawbacks common to other synthetic stones. They won’t yellow, crack, chip or craze like other synthetics. They are more resistant to heat, and they are less susceptible to damage from chemicals like acetone. These opals take approximately a year to develop. A demanding quality process ensures that only the best material ever becomes opal jewelry. • Ranks four on the Mohs scale of hardness. 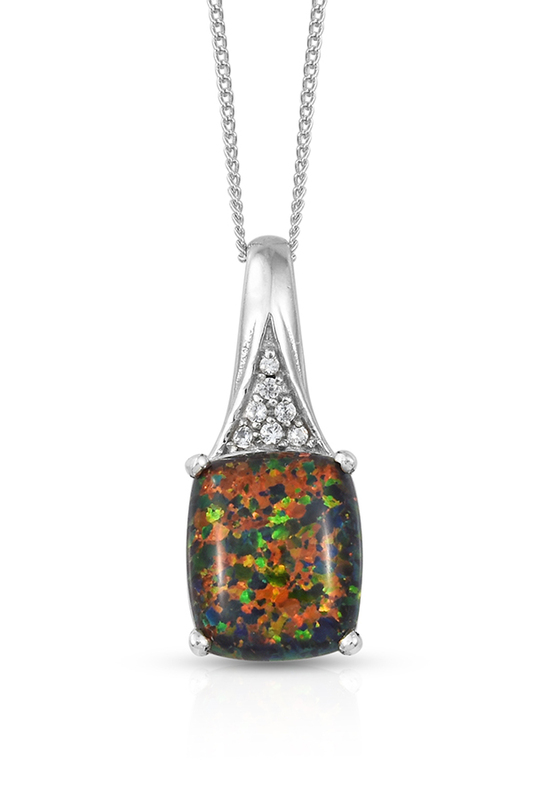 • Lab Created Black Ridge Opal has a black body color with a full play of color. Pinpoints of rainbow color heavily saturate the entire gem. • These synthetic opals are grown in China with proprietary technology developed in Japan. 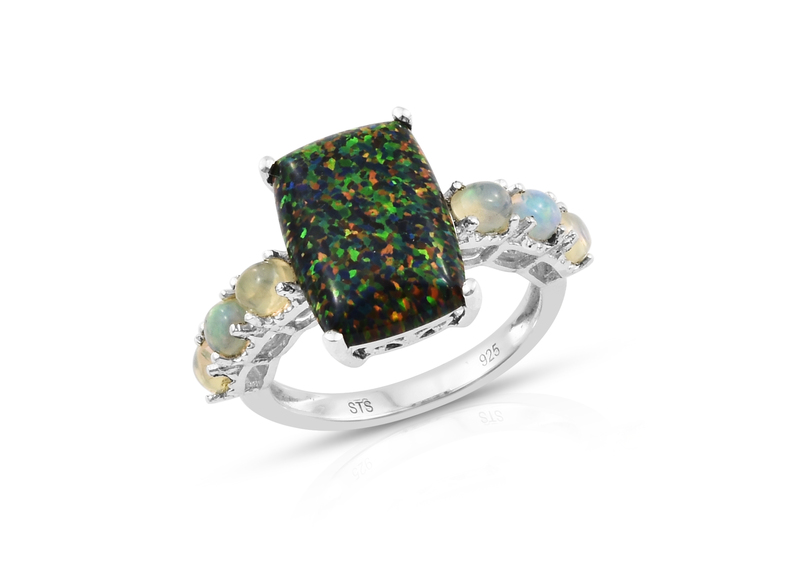 • Lab Created Black Ridge Opal is a synthetic gem that is also stabilized for added durability.